Microgeographica is a solo exhibition of new works by Toronto-based artist Carly Waito (born in Manitouwadge and raised in Thunder Bay). 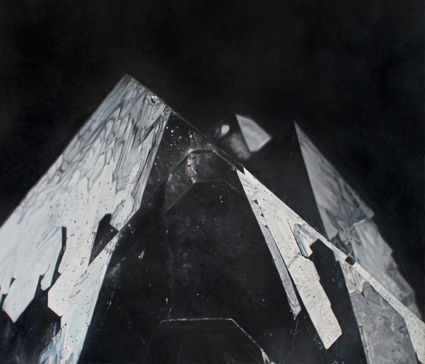 Through detail-rich oil paintings, graphite illustrations and a projected video work, Microgeographica showcases Waito’s ongoing series exploring the unique beauty of precious mineral specimens. As a painter, Waito pursues her inspiration, with a focus towards geology, geometry, light, and a sense of wonder and curiosity. These themes are uniquely encompassed by the tiny mineral specimens which have become her particular obsession. With each finely detailed oil painting, Waito focuses the eye on a specimen’s particular qualities, showing the beauty and magic that is present even in nature’s smallest parts, if one looks closely enough and with a curious mind. Waito has exhibited nationally/internationally and her work is held in private collections in Europe, Australia and North America. Waito has been featured in several major publications and is a recipient of grants from the Ontario Arts Council. Join us for the Gala Opening Reception Fri. Feb.13 @7-10pm featuring a ferocity of art with 3 new exhibitions and special one night only musical performance by Nancy Pants of Montreal- [w/Adam Waito of Adam & The Amethysts/Miracle Fortress] Lots of catered and cool winter refreshments, artist talks and more! Shows run until March 14.